FLEXIBLE: Finally a system that grows with you! Start off with one Deluxe Power Module and one or two flying bus cables (keyed of course to avoid reverse polarity mistakes!) then graduate to our Noise Filtering Power Distribution boards as your module count grows. 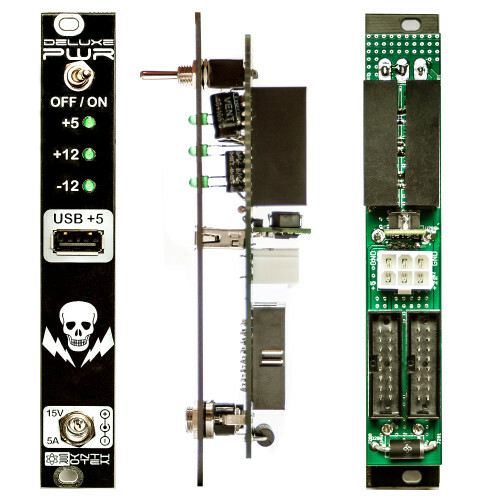 Connecting to our boards is a ‘snap’ now with our new Molex ‘quick-release’ power system that allows you to daisy chain Synthrotek distribution boards with ease. POWERFUL: The front panel takes a standard 2.1mm center positive plug and is compatible with our locking DC jacks. For maximum flexibility, this power supply kicks out all 3 rails (-12, +12, +5) with adequate power for a medium-sized case: Ideal for up to 2 rows of 104HP (may power more modules, but it is not guaranteed). A 15-24V power brick is required (16-24V is recommended) to operate this product (can be purchased as an option above). A 90W power brick is recommended to take full advantage of all the power this unit can deliver. Click HERE and HERE for technical information on the +/- 12 DC to DC converters. Click HERE for technical information on the 5V DC regulator. Please note: If you choose to build this unit yourself, please know that this is a VERY ADVANCED build. If you feel up to the task, please proceed! If not, get some help from a friend with experience or purchase a fully completed unit. My question is when i check the resistor list its not the same color and value than on the pcb picture. The flat resistor is 2.2 but what about the 2 stand up resistor? The pictures are not always as accurate as we would like, due to some changes that may happen after the pictures are taken. The list on the BOM is always the most up to date and is what should be followed when building. considering it uses switching regulators, how noisy is it? we haven’t measured any significant noise, nor has any been introduced into other modules from the Deluxe Power Module. This thing is one solid power supply! Would the USB connection power a QuNexus sending CV? Yessir! We use a QuNexus all the time with our Deluxe Power. Its excellent for tuning DS-Ms! It can also power the Beat Step Pro or really anything that calls for 1 amp! which 90W brick would be better: 24V/3750mA or 19V/4740mA (and why)? Awesome! I just watched this video and this is exactly what I’ve been looking for… but when checking a couple vendors, none of them have it. I need it finished/built/complete as I am not up to advanced built yet. And where to get the rails featured at the end of the video? This combo seems to be perfect for my needs but I can’t seem to find anywhere to buy it. I recently purchased a system with two Tip Top Zeus boards, but no power panels (they’d been removed). Would this be a good replacement? I have one and I’m curious about the power limit. Modular Grid shows I’m getting close to the limit in +12 modules but some of mine do not have power information. Is there a danger in connecting more modules than this can power? Can it damage my modules? is there a fire hazard? The Deluxe Power Module has safety in mind when it comes to drawing too much. The offending rail LED will blink on the panel and will shut off temporarily, giving you the opportunity to power off and remove modules. Chances are that you’ll notice it upon powering up your rig as many modules require more than the rated amount to start up. Some general symptoms of strain on the power supply are oscillators not tracking properly, LED’s dimming or flickering.